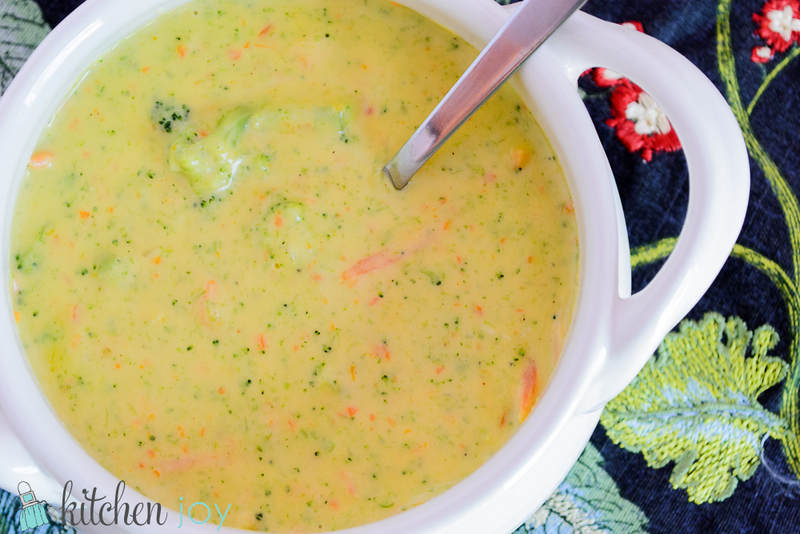 This Cheddar Broccoli Soup has become sort of a standby recipe that I bring to friends who have just had a baby. It’s easy to make, and it reheats well. The addition of nutmeg and hot sauce (I know, it sounds weird…especially since I loathe hot sauce) help to subtly enhance the flavor of the cheese. It is a favorite of ours, and I hope you enjoy it too! In a large pot over medium heat, cook melted butter and flour using a whisk for 3-5 minutes. Stir constantly and slowly add the half-and-half (this is called making a roux). Add the chicken stock whisking all the time. Simmer for 20 minutes. Add the broccoli, carrots and onions. Cook over low heat until the veggies are tender, about 20-25 minutes Add salt and pepper. The soup should be thickened by now. Pour in batches into the blender and puree. (This is where an immersion blender is very useful. I puree mine just enough so that there are still some bite-size broccoli chunks.) Return to pot over low heat and add the grated cheese. Stir until well blended. Stir in nutmeg and Frank's Red Hot sauce.